THIS PROJECT SPONSORED BY THE HOME DEPOT CANADA. Thank you for your support of me and the sponsors who make this blog possible! Moving on. 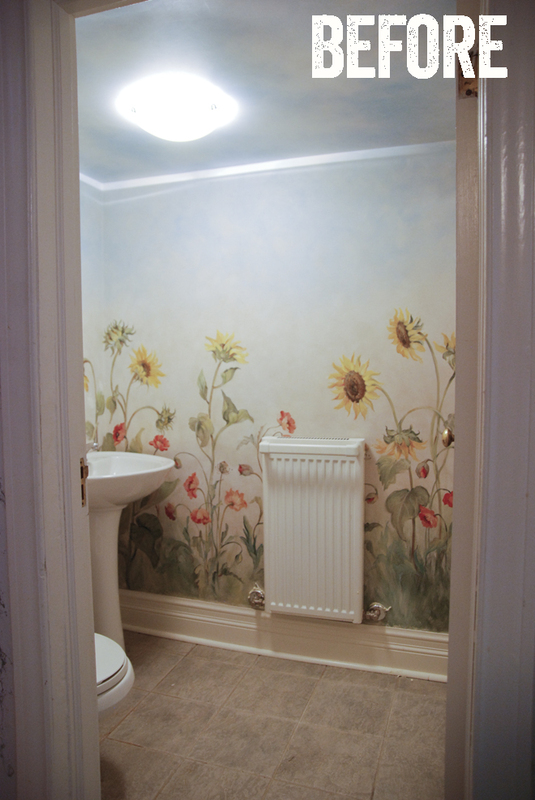 To get the clean, fresh look I craved in this small bathroom, I knew beadboard was the way to go. We researched our options extensively. There are so many different varieties of beadboard: thick or thin planks, wainscot (3') height or full height, individual planks or ready-to-install panels. To keep costs down, we went with the beadboard panel. We wanted to take the beadboard higher, 2/3rds up the wall, so we used the Portside 2" Beaded Panelling from The Home Depot. Here it is installed. 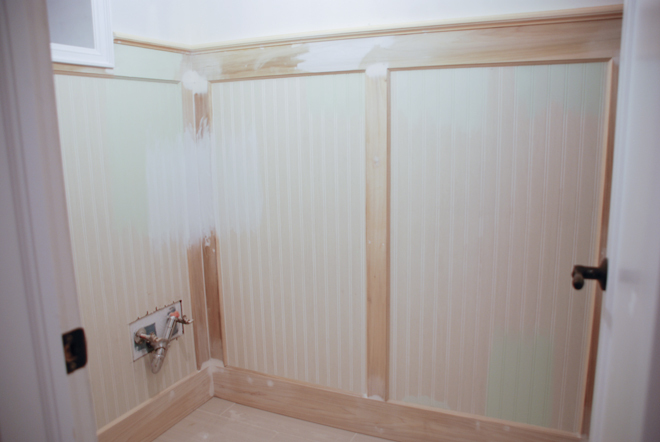 You can see I couldn't resist testing out some paint colours :) With beadboard panels, you need to plan out the seams as the panels are typically 4' wide and your walls are often wider. 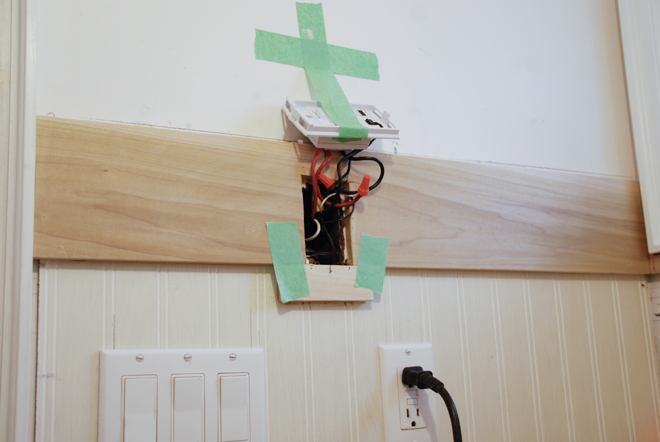 We had one seam so we (and by we I mean HandyMan) cut down the panel so the seam fell in the middle of the wall. 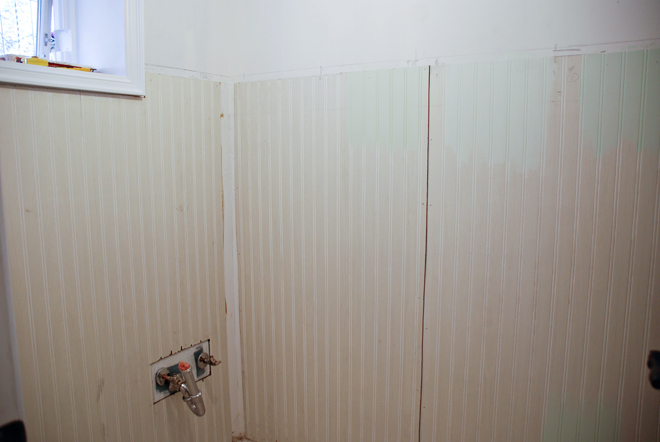 You also need to consider how to finish off the beadboard. Unlike tongue and groove panels which fit nicely together, the edges of the beadboard sheet are rough and uneven. To hide the bottom edge, we wanted a substantial 5" baseboard. The floor was a bit uneven so HandyMan had to scribe the wood. 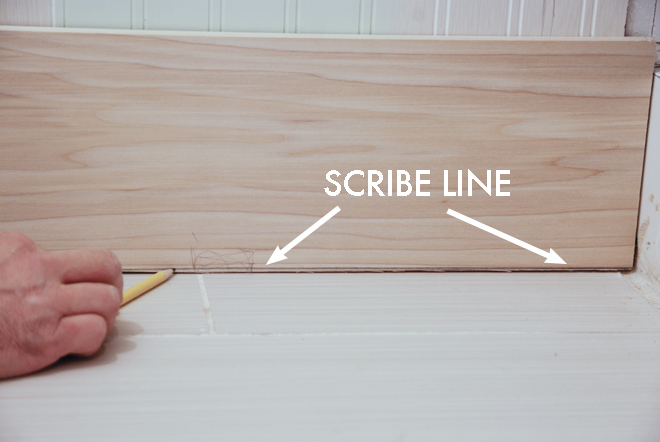 He did that by running a pencil along the floor perpendicular to the wood, and scribing a line onto the wood. The pencil mark mimics the angle of the floor and by cutting along that line, you get a nice tight fit. We hid the top edge with a similar flat piece of wood. We planned it so that the thermostat for in-floor heating (which was already installed in the wall) fell squarely on this piece. 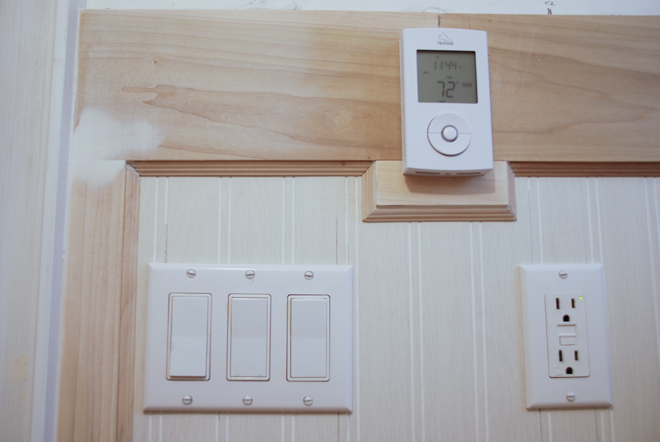 Just like we did with the sconces in our master bedroom, we built out the trim around the thermostat for a more custom, professional look. With trim, the key is to keep proportion and balance in mind. You don't want trim to look too skimpy or too oversized.